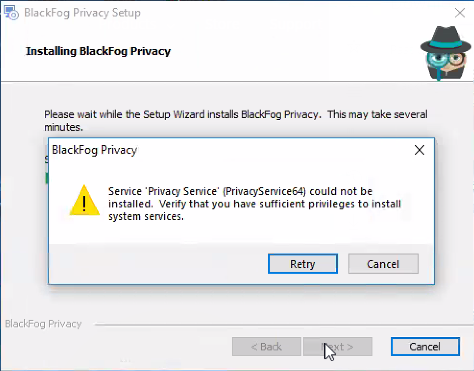 When installing BlackFog it automatically creates a service in order to operate correctly on your system. If the user account has been modified by a system administrator the installer may fail to create and execute the service under you local account. You will see the message “Verify that you have sufficient privileges to install system services”. Normally user accounts within Windows already have the appropriate privileges to install a service correctly. However, some systems have this modified to prevent local accounts from doing this. In these situations it is important that the permission is granted using the procedure below. Click Start, point to Run, type mmc, and then click OK. In Add/Remove Snap-in, click Add, and then, in Add Standalone Snap-in, double-click Group Policy Object Editor. In Group Policy Object, click Browse, browse to the Group Policy object (GPO) that you want to modify, click OK, and then click Finish. In the console tree, expand GroupPolicyObject [ComputerName] Policy > Computer Configuration > Windows Settings > Security Settings > Local Policies > User Rights Assignment. If the security setting has not yet been defined, select the Define these policy settings check box. When finished, close out of the Group Policy Object editor and refresh the local group policy on the server by running gpupdate /force in an administrative command prompt.